After a long period of usage, the amount of transactions stored in the application increases. This will slow down your application speed. By archiving, it will archive transactions that are months before your current date. * System will backup a copy of your current database automatically when you archive. In a normal scenario, the application would suggest you a date range to archive. If you have not clock out certain users or finalise your cash till, you won't be able to archive your database. Receiving such error message, please go under login page and check if all users have clocked out. In Cash Register, click on Functions -> Manage Till, enter ending till amount and Close Till. Upon archiving, you could still locate your report and past receipt. However you can't modify them. Click on Backup Database to backup your application database manually. If Auto Backup is switched on, system will perform a daily backup automatically. 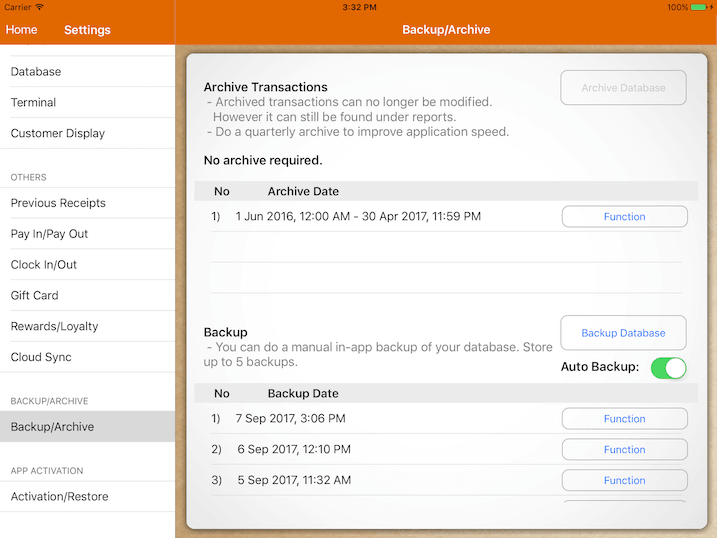 Store up to 5 backups and the newer backup will overwrite the old. You could email your backup by clicking on Function and restore from it later on. Backup contains stock file, transactions, setup and customer information. Backup does not contain images and archive. To have an entire backup of the system, please use CMS via Web instead.